PETER O’MAHONY’S FATHER has spoken of the pride he’s feeling as his son prepares to captain the British and Irish Lions in their first Test against the All-Blacks this weekend. The Munster player will follow in the footsteps of former Irish legends Paul O’Connell and Brian O’Driscoll when he leads the team out tomorrow morning in Auckland [KO 8.35am Irish time, Sky Sports]. O’Mahony has had a remarkable season in which he earned his spot in the Lions squad after making just one start for Ireland in the Six Nations. He captained the side against the Māori All Blacks earlier in the tour, and has been awarded the title once again for tomorrow’s crunch tie against New Zealand. His father John O’Mahony has travelled to New Zealand for the game, and speaking to Today FM’s Ian Dempsey, he described the impact of his son’s achievement on him. “It’s what every parent would wish for their son. It’s just an unbelievable accolade that he has achieved. It’s incredible and I’m thrilled for him. “Whatever aspiration you have for your children and (you hope) it works out for them, that’s wonderful but certainly, this was a little step beyond which anybody could have reasonably expected. O’Mahony went on to say that while he didn’t become emotional when he heard that his son was awarded the Lions captaincy, he admitted that there was some “yahooing and dancing around the place”. “Ultimately, it was a huge surprise, there’s no getting away from that and the significance of his captaincy against a Māori team in New Zealand wasn’t lost on me. “We got together for a good time yesterday. I think that’s a period where he doesn’t feel obliged to talk about rugby. We talked about home, his brothers and catching up on news from there. Email “'It's what every parent would wish for their son': Peter O'Mahony's father”. 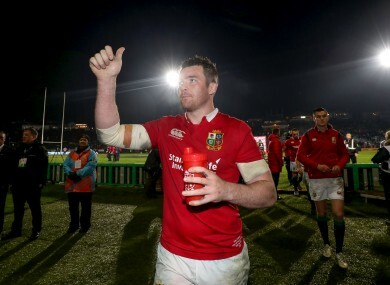 Feedback on “'It's what every parent would wish for their son': Peter O'Mahony's father”.